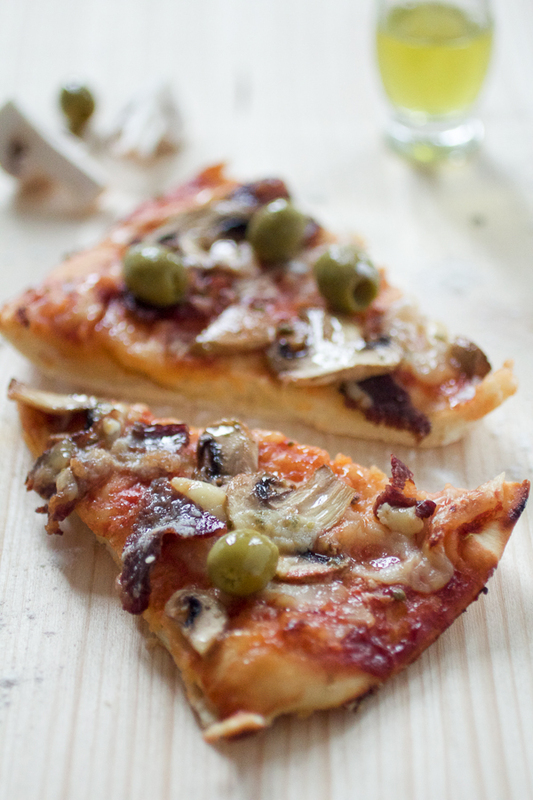 Today we do Sarajevo pizza: an unconventional but extremely tasty take on a classic. If you’re gonna have a one-hour, one-pan type of meal, make it this! Za recept na bosanskom, kliknite ovdje. Inside each one of us is a child. And the list of what that child likes to eat is fairly short. On top of that list is pizza. I am – and was – no different. Fuelled by the love for Ninja Turtles, pizza was all I wanted to eat as a kid, together with a boatload of chocolate bars. Unfortunately for me, mom made grown up things like stuffed peppers (punjene paprike) and bey’s soup (begova čorba). But on special occasions my siblings used to take me to a charming, little pizzeria up the street called “The Galley,” where I munched on beloved dough topped with cheese and lots of mushrooms that made such a harmonious crunch in the mouth. I did get my fill of pizzas once I moved to the States as a teen, but that had to be stopped short. Like most girls that age, I was worried about staying skinny and preventing pimples, so pizza had to take a back seat. Although pizzas in upscale pizzerias in Sarajevo serve more of what one finds in Italy – soft and thin crust with red tomato sauce – homemade and fast food versions of pizza in Sarajevo are an altogether different animal. And that’s exactly the pizza we’ll be making today. Except for in Dalmatia (where pizza takes after its Italian cousins) and Sarajevo, I didn’t try pizza elsewhere in the Balkans. Therefore I cannot vouch that this is what you’d find going to Zagreb, or Belgrade, or Ljubljana. But I can guarantee that this recipe is the average pizza you’ll find in Sarajevo. And I can also promise that it’s heavenly. The crust is thin and soft, and just a tiny bit thicker than Italian. Making it is a lot like making dough for bread. Yeast, white flour, warm water, olive oil, and some dough kneading is all that’s necessary. But the surprise is in short rising time. 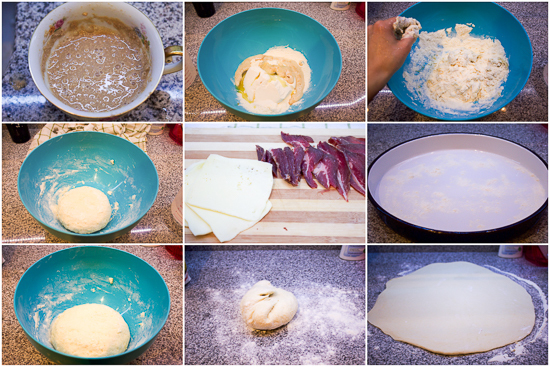 Pizza dough only needs half an hour to rise, and it’s ready to be kneaded, topped and placed in the oven. 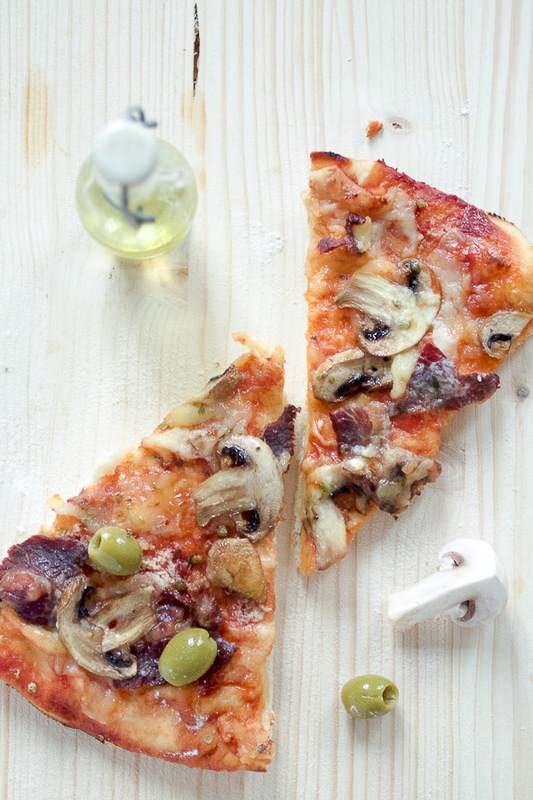 Toppings differ, but the ones we’ll use today are your typical Sarajevo pizza. After the sauce you’ll generally start off with some yellow cheese. Edam or gouda will do. See if you can grate it. If that’s not possible, cut the cheese into thin slices (the thickness of Kraft singles), and then tear each slice up into a few smaller pieces and then spread over the dough. This is so the cheese melts evenly, and the dough underneath has an opportunity to breathe. Keep in mind, while cheese is a welcome and lovely addition to pizza, it’s not to be saturated in it. On a Sarajevo pizza, cheese is a soft transitional zone between crust and toppings, not the only topping. 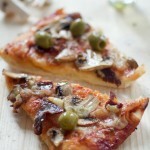 As for the other toppings, there is often a handful of mushrooms involved, mostly portabello and generally diced. Then there are some olives, added almost at the end of baking to help them keep fresh and avoid drying. There are more toppings, but these few are the most typical ones. To top it all off (I couldn’t help myself 🙂 ), use a bit of oregano to give it that recognizable Sarajevo pizza aroma. At last I’ll reveal to you the secret behind Sarajevo pizza sauce. The sauce (I can hear your shocked gasp as I’m typing this) is actually just the good ol’ ketchup. Yup. Ketchup. I can’t explain this one. I can’t defend it either. Ketchup on pizza crust instead of the tomato sauce is a crime against pizzas everywhere and I don’t know which lunatic came up with the idea. So if you are a serious foodie, I kindly ask you give this pizza a chance because it may surprise you in ways you never thought possible. And for my other folks who already know how tasty it is, but were wondering how in the world to make it, the recipe is finally here. 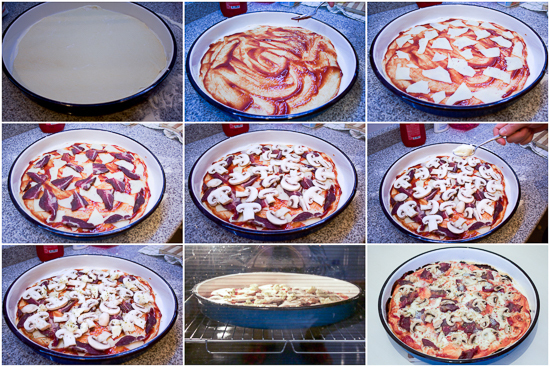 A quick baking note – if you have a pizza stone, go ahead and bake on it. Otherwise foil or a large pan will do just fine. If you’re unsure whether your flour will stretch nicely you can give it a dough test before you make it. And if you take away one thing from today’s article, it is to bake your pizza for only about 10-12 minutes in a ridiculously hot oven (we’re talking 480-500F). Feel free to come back and tell me how wonderfully it came out! While you’re at it, save me a slice, I’ll be over in a minute with Ninja Turtles. Mix yeast with sugar and a little bit of warm water and leave aside to rise for 10 minutes. Dust your hands with flour. Combine yeast mixture with flour in a larger bowl, add 2/3 cup of warm water, and start kneading the dough. Add water gradually as you are working the dough. You may find you need a little bit more or a little bit less. You want to make the dough that’s elastic, and easy to stretch. Once the dough ball is made, leave to rise in a warm place for 30 minutes. Heat oven to 480-500F. Prep your toppings by slicing up the meat and mushrooms thinly. Grate the cheese, or if unable to, tear each slice up into a few pieces. Take the dough out of a bowl and place on a dusted working space. Roll it out until it’s about 14-15 inches in diameter. Transfer onto a pizza stone or a round pan that’s been dusted with flour. Spread ketchup evenly over the pizza. Add cheese first and then the remaining toppings: meat, then mushrooms and finally kajmak. Finish with oregano.